In factories, many simple, repetitive tasks have already been taken over by machines. But as we bring industrial robots into unpredictable, interactive environments, we’re going to need better ways to communicate with them. 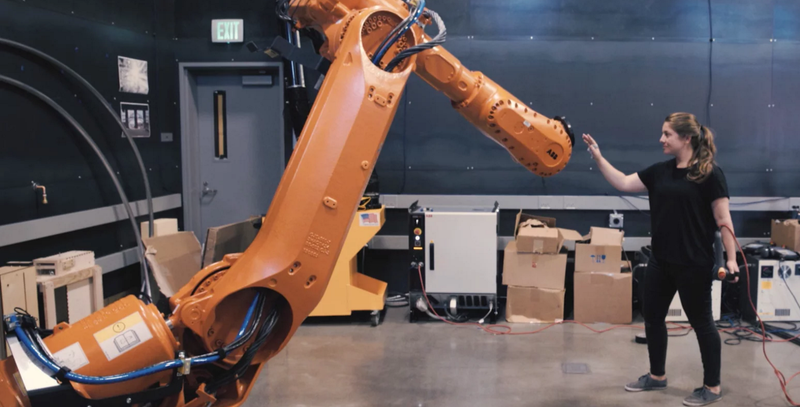 That’s why engineer and designer Madeline Gannon developed Quipt, a gesture-based control software that helps industrial robots interact more fluidly with their human handlers. Wearable markers on a persons’ hands or neck are paired with a motion capture system, allowing the robot to see and respond to simple signals. One could imagine construction workers using this technology to tell robots where to drill or weld, and when to stop, with a flick of the wrist. Learn more about Quipt in the video below, and on Gannon’s instructable here. Watching a half ton machine respond to a human like a tame animal, I can’t help but feel that we’re already living in the future.